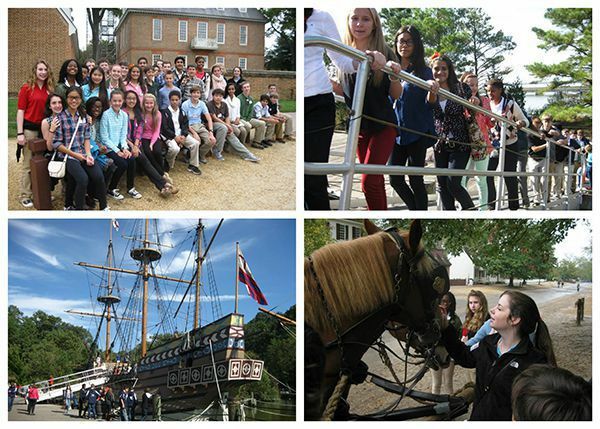 On the eighth grade trip, the students began their journey in the Jamestown Settlement Park, where they saw what they studied in the classroom in September come to life. The group toured the site’s museum where they were exposed to an overview of the three cultures that came together in Jamestown, the English, the Africans, and the Native Americans. From there, we visited the recreated Powhatan Indian village where the students literally stepped into a yahakin (the traditional Powhatan house), scraped deer hides with oyster shells in Algonquian style, and generally learned about the culture of the native people in the area of the Virginia colony. Next, they bobbed up and down just like the early settlers did in the body of the Susan Constant, a recreation of the ship that the Jamestown settlers used on their perilous and trying trip across the Atlantic. Finally, they visited James Fort, which depicted the way of life of the earliest colonists when they arrived in the new world. The students ventured into the interior of their church and homes and watched a reenactor demonstrate the use of a musket. After such an informative visit in Jamestown, the students traveled on to Williamsburg where they enjoyed a delicious meal and colonial-style musical performances at Shield’s Tavern on Friday night. This was followed by another treat, an eerie, lantern-lit ghost tour of key colonial sites. Then their teachers tucked them in tight at the hotel because the next day brought a full set of tours, including all of the most important places in Colonial Williamsburg, the Capitol Building where the colonial legislature met, the Governor's Palace, Bruton Parish Church, the Magazine where weapons were stored, the printing office, and the blacksmith shop, among many others. Our guides provided detailed analysis of each site, which will aid our students in developing an in-depth understanding of the colonies during the Revolutionary years when we study that in the classroom in the coming weeks. However, in addition to the academic benefits, this overnight trip was a wonderful opportunity for the students to continue to forge a deep bond with their Westminster classmates, which will stay with them for a lifetime. The eighth graders and their teachers had a wonderful, unforgettable time this past weekend!